BMW’s third model of the new 8 Series family was just spotted on the famous Nurburgring track – the 8 Series Gran Coupe. 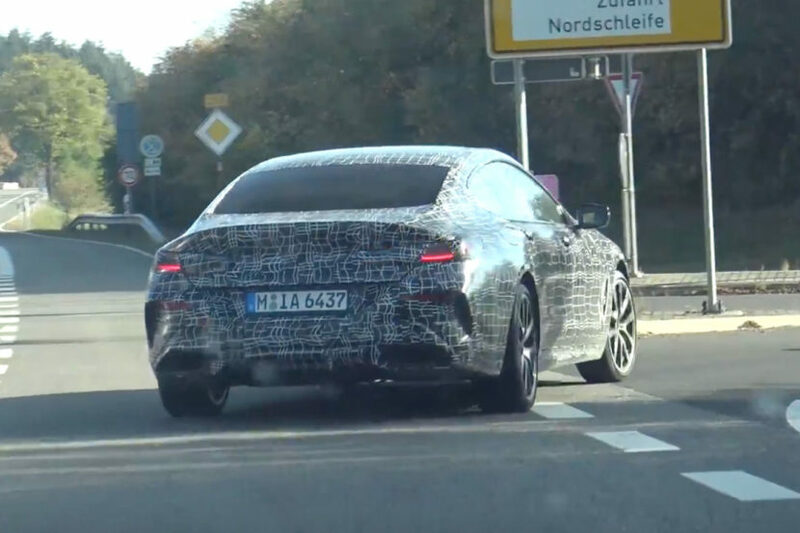 In this video alone all the new 8 Series models are seen driving on and around the Nürburgring, including the 2019 BMW M8, M8 Convertible, M850i Coupe, M850i Convertible and the M850i Gran Coupe. Just recently, some spy photos have shown the 8er Gran Coupe and it looks great. You can see at the front its large air curtains and the ducktail rear wing integrated into the decklid. While the 6 Series Gran Coupe was, and still is, a stunning car, this new 8 Series Gran Coupe seems like it could be even better looking. It’s smoother, longer, meaner and more muscular looking. Its rear hips seems wider and its front end seems more aggressive. The car in this video is clearly a BMW M850i Gran Coupe, with its blue brake calipers and twin rectangular exhausts giving it away. Which means there’s still room for the BMW M8 Gran Coupe to come along and blow us away, much like the M6 Gran Coupe looked significantly better than the standard 6er GC. In the mean time, the BMW M850i Gran Coupe will be the top model of the 8 Series family, powered by a 530 hp 4.4-liter twin-turbo V8, which, in the Coupe, is capable of delivering a 0-62mph sprint time of 3.7 seconds; that figure is likely to increase in the Gran Coupe.